If you haven't been introduced to Henry the Tulip Bulb yet, here's your chance. In this book, you'll also meet his good friend, Scout. Follow these characters on an adventure throughout the streets of St. Augustine, Florida. A story for children of all ages, you'll find yourself intrigued and inspired by the quaintness of St. Augustine, portrayed through beautiful, vivid illustrations and funny little characters. Its message—developing an attitude of gratitude—is woven throughout the Henry the Tulip Bulb series. 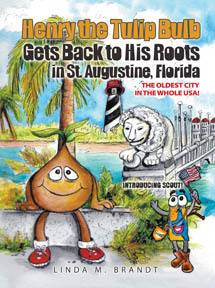 In Henry the Tulip Bulb Gets Back to His Roots in St. Augustine, Florida, children will learn about St. Augustine, the oldest city in America—a place of history, beauty, and blessings! Having drawn since the age of four, author-artist Linda M. Brandt landed her first professional job illustrating political cartoons at the age of nineteen. Her work has been displayed in prestigious venues from Paris to London and New York to Laguna Beach. Many of her paintings are held in private collections around the world including the portrait of the late President Ronald Reagan along with portraits of past Ohio governor, George Voinovich and several senators. Linda is the only known adult survivor of a particular rare and serious brain tumor. While in critical care and inside an MRI chamber Linda had a near-death experience of which she wrote in her book, My Jonah Journey: Developing an Attitude of Gratitude. Collectors of her paintings believe her work is even more inspirational and dramatic than before. She and her husband, Scott, live on Anastasia Island in beautiful St. Augustine, Florida with their labradoodle, Max. "Not only is the book perfect for children, but even adults can discover something new about the oldest city in North America. With each beautifully illustrated page, you are invited into the world of Henry the Tulip Bulb and his sidekick Scout as they explore many famous locations in St. Augustine. Through their adventure, one can cross over 450 years of time to delightfully learn, explore, and appreciate the religious value that is the foundation of our great country . . . and it all started here in St. Augustine." "Linda Brandt has written a fun and beautiful book to help young readers know the sights of historic St. Augustine and how it was founded. More importantly, she reminds us all that St. Augustine, Florida, the oldest city in the United States, was founded upon a strong faith in God. A must read for parents and their children as they explore this beautiful and blessed city!"